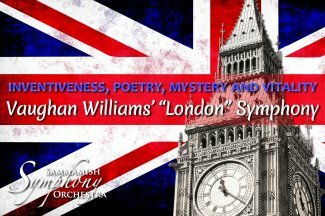 Come enjoy the sounds of the Sammamish Symphony as they present a program featuring Wagner's lively Tannhäuser: Arrival of the Guests, Brahm's beautiful Violin Concerto in D with soloist Allion Salvador, and Vaughan Williams' powerful Symphony No. 2 "A London Symphony" which paints a vivid and moving picture of London immediately before World War I. Visit SammamishSymphony.org for tickets and more information.